On October 5th , Bufete Escura signed a collaboration agreement with the certification body TÜV Rheinland Ibérica, Certification & Testing. 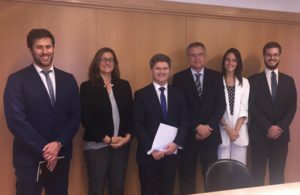 Bufete Escura is one of the reference offices in the implementation of protocols of Corporate Criminal Prevention in order to comply with the exemption provided in article 31 bis of the Spanish Criminal Code. Bufete Escura, among others, has repeatedly requested the approval of homogenization systems for the procedures, to allow their certification. In this sense, the UNE 19601 has recently been approved. TÜV Rheinland, is a multinational leader in the certification of quality management systems, environment, safety, and occupational health, as well as Corporate Criminal Compliance. In order to achieve the highest levels of quality, Bufete Escura has adapted its procedures in relation to the protocols of Criminal Prevention to the UNE 19601: 2017, and has signed a collaboration agreement with TÜV Rheinland, to be able to certify by an independent the procedures and protocols of Bufete Escura in the Corporate Criminal Compliance area. The agreement was signed, on behalf of TÜV Rheinland, Mr. Gonzalo de Castro and Mr. Fernando Escura, on behalf of Bufete Escura. The firm was attended by executives from both firms.